Intermezzo is grateful to loyal patrons who are able to support our musical activities. If you are able to contribute to the work of the choir, consider joining the Friends of Intermezzo. Become a friend for £25 per year and receive advance ticket booking and seat reservation (up to four seats per concert), an invitation to one of the choir’s social events during the year, an exclusive newsletter about the choir's activities, and recognition in our programme. 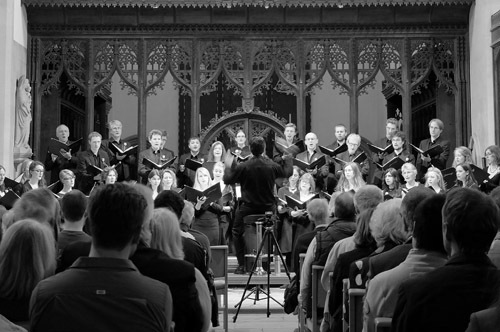 Become a benefactor for £250 or more and you could also be associated with a specific activity of the choir, such as a recording session or masterclass. Alternatively you can contact us for further information, or email friends@oxfordintermezzo.co.uk. Please note that if you donate £25 or more and select that you are willing to be contacted then we will get in touch to see if you would like to become a Friend of Intermezzo. We appreciate all of our supporters, whether or not they can contribute financially. If you would like to be kept up to date with concert information and ticket availability then please join our mailing list, by entering your email address below, or contact followers@oxfordintermezzo.co.uk.